A visual to help with planning for the new year…Less? Same? More? What if…? For many of us, the lead up to the end of the year, and the Christmas season can be a hectic one! Some of us are desperately trying to knock off those remaining ‘end December’ items off the ‘to do’ list. And those lucky enough to have a break, look forward to emptying the brain, being kinder to the body, and replenishing the soul! We like to start the new year reflecting on the successes of the last, and thinking about how we can make the new year ahead an even better one. What do we want to pay more attention to? What do we want to be the same? What do we want to stop? What do we want to start? We recently came across a post by Lynne Cazaly, a ‘keynote speaker, author and mentor’ who also happens to create some amazing visuals that ‘help people distil their thinking, apply ideas and innovation and boost the engagement and collaboration effectiveness of teams!’ Her pre-Christmas newsletter shared a simple yet powerful visual template called ‘Less Same More’, which presents a really creative way to explore the ‘stop, start, continue’ concept’. 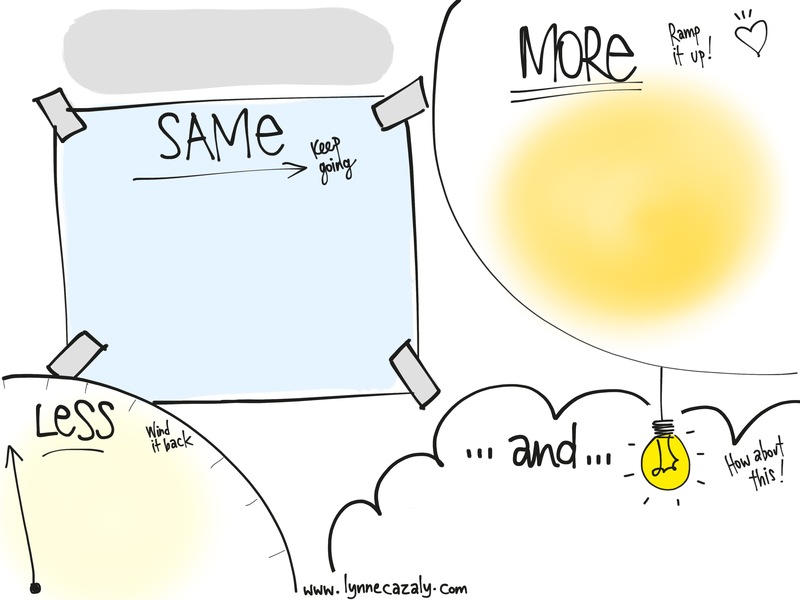 As Lynne writes, “What do you want more, less or the same of…? SAME: keep on truckin’, keep going, keep moving with this stuff. What if…? Imagine if we…? I wonder what would happen if…? So how might you use a visual like this? Maybe this could become your personal plan on a page for career and personal development? It could possibly be where you capture your thinking around your personal 2017 wellbeing goals? Maybe it could help you ‘keep’ your New Year’s resolutions?! Or when reviewing your DiA Leadership action plan, create a one page visual to keep you on track? It is critical to make time for reflection – and for planning. This tool is a great one to help make these things happen. Click here to see Lynne’s website. ← MBWA – Management by wandering around!